WeatherTech Car Mats are very popular USA made OEM replacement car floor mats!!! WeatherTech Car Mats are manufactured by MacNeil Automotive Products Ltd. which has its headquarters and factory (thermoforming and injection molding operations) in Bolingbrook and its engineering and tool making facility nearby in Downers Grove, Illinois. MacNeil not only designs, prototypes and manufactures its products in America, the company also sources most of its raw materials, machinery and equipment from North American sources. Of special note is WeatherTech's relationship with a large US manufacturer of tonneau covers who supplies WeatherTech with its Roll-Up Pickup Truck Bed Cover product. If any automotive products company that makes such high quality products deserves your business, it's MacNeil Automotive. WeatherTech Car Mats come in two basic styles. The WeatherTech Digital Fit Floorliner and the WeatherTech All Weather Floor Mat. 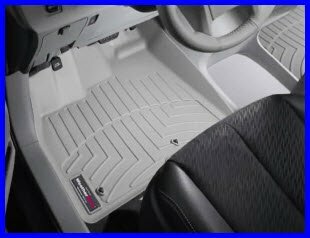 In addition WeatherTech Car Mats manufactures and sells two styles of cargo mats to match the floor mat products. The floor liner and cargo liner products are made from a thermoplastic rubber compound that typically is more than 40% rubber mixed with polyethylene and polypropylene. The resulting compound is soft to the touch but very durable. The regular floor mats and cargo mats are made of 100% rubber. None of these products has a bad smell like some floor mats do. OK, here's the scoop on these fine, made in the USA, WeatherTech Car Mats and cargo mats. The WeatherTech Floor Liner is digitally designed to fit your floor like a glove. In fact, it kinda seems like a thick plastic coating sprayed on your car floor carpet - it's that close of a fit. It's made of a high density tri extruded (HTDE) rubberized plastic material that sheds dirt from your boots but grabs the carpet underneath. It’s channeled on top to carry liquid gunk away from your feet towards a reservoir area behind the accelerator pedal. On the underside of the liner are ridges to prevent the liner from slipping on your vehicle carpeting. And, of course, if your vehicle is fitted with anchor posts, your new WeatherTech FloorLiners come with the appropriately spaced grommets. The edge of the liner fits over the rocker panel, so when the liner fills with water or whatever, you just tilt it toward the door and it hopefully empties outside the car. Be careful when you empty these mats not to dump the trapped liquid onto your pants and shoes! And, of course, remember when you install these liners to remove the carpeted or rubber mats you already use, so your new floor liner sits happily and securely on top of your vehicles carpet. These floor liners are a great alternative to floor mats. They provide greater coverage of your car or trucks floor pan and seem to move around less than regular car mats made of comparable materials. This amazing product from WeatherTech is similar in design and quality to the FloorLiner. Using all kinds of fancy CAD/CAM, lasers and digital manufacturing machines, the folks at MacNeil Automotive make a liner for your cargo area that fits better than a glove. The liner is deep enough to carry goldfish in (no, not really!!!). But it is deep enough to prevent pet accidents and other liquids and dirt from getting to the carpeting in your cargo area. 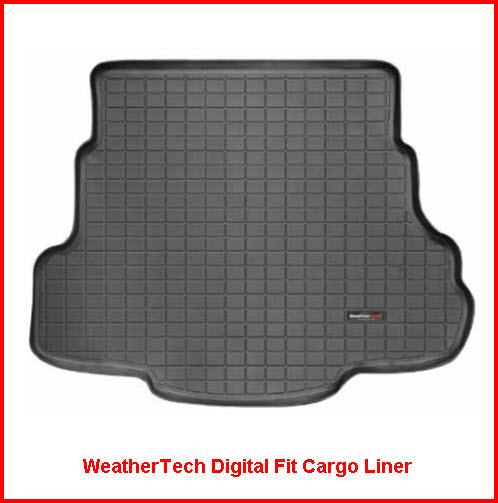 Just think of this WeatherTech Cargo Liner as a really big FloorLiner that fits your cargo area. So, if you don't need to transport goldfish but you still want to protect your cargo area, the WeatherTech Cargo Mat is the way to go. Similar in manufacture and properties to the WeatherTech Car Mats All Weather Floor Mat, this cargo mat is a lower cost alternative to protecting your vehicles cargo area. Remember, like the All Weather Floor Mat it may need to be trimmed to exactly fit your vehicles cargo area.